Calendar of Events: Pull Out Poster! signaturecity@pbgfl.com Signature City Questions: 561.799.4152 Main City Line: 561.799.4100 Signature City magazine is a free publication produced quarterly by the City of Palm Beach Gardens Public Media Relations Division. Signature City is mailed to every household in Palm Beach Gardens, as well as distributed at city facilities. Signature City magazine is printed on recycled paper. 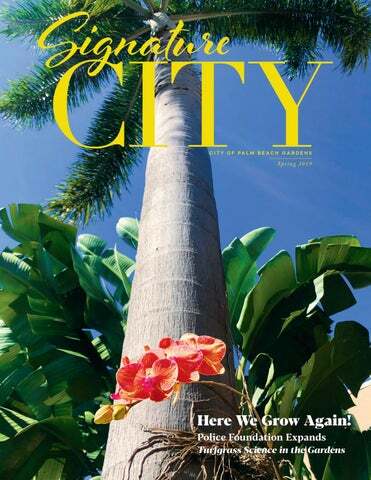 ON THE COVER: Spring is in full bloom in Palm Beach Gardens! This orchid smiles down from a palm tree located at City Hall. have always been extremely interested in the Police community. In my younger years I grew up around my local police officers, and since then, I’ve remained extremely interested in their work. I asked myself how can I be involved in a program working alongside our local police officers? Reggie Boyd has volunteered with the City’s Citizens Mobile Patrol program for a year. When I met a Palm Beach Gardens Police Volunteer, he explained to me the Citizens Mobile Patrol and the general mission of the program. The importance of the program and the Police Department’s need for more volunteers caught my attention. 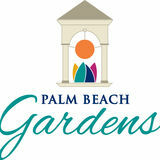 I immediately applied and received training to become a Palm Beach Gardens Police Volunteer! My current role involves driving a mobile patrol vehicle equipped with lights, a police with cancer, he worked as a Palm Beach Gardens fire/medic. Following his death, I have volunteered as the Post Advisor for the Gardens Fire Rescue Learning-for-Life Explorer program. I also work as the Chairman of the Advisory Committee for the Police and Fire Explorers, which has about 640 youth in 7 counties. Tommy Thurman has volunteered with the Explorers program for the past 13 years. How can I Tell if I or a Loved One is EXPERIENCING A STROKE? troke or “brain attack” is a condition in which the normal blood flow to a part of the brain is interrupted either by blockage of an artery or by a ruptured blood vessel. Strokes that are caused by a ruptured blood vessel often cause a sudden severe headache, which people often describe as the worst headache of their life. However, 90% of stroke cases are painless. Risk of stroke can be reduced by quitting smoking, maintaining a healthy lifestyle, lowering cholesterol and blood pressure, along with regular checkups from your primary care physician to modify other risk factors with medications. The brain controls all the activities of our daily life. It allows us to think, see, hear, taste, feel, communicate, move, breathe and coordinate our limbs so we can manage to walk. An ischemic stroke occurs when one of the arteries feeding the brain gets clogged up, usually with a blood clot. The stroke symptoms will be determined by what area of brain that particular artery supplies. In 2008, the Palm Beach Gardens Police Foundation was established by a small group of local citizens who recognized the need to provide additional financial support to the Palm Beach Gardens Police Department. In July of 2018, during its tenth year of operations, the Board of Directors voted unanimously to change our mission to include support of the Fire Rescue Department. e worked closely with Police Chief Clint Shannon and Fire Chief Keith Bryer to make this happen. excited to now expand that partnership to include our Fire Rescue Department,” said Chief Shannon when asked how he feels about the Board’s decision. PICTURED: (l to r) Palm Beach Gardens Police Chief Clint Shannon and Palm Beach Gardens Fire Chief Keith Bryer work with the Police & Fire Foundation to support their departments. for high school seniors serving a tri-county area. In Palm Beach Gardens, the program has been implemented in both PBG & Dwyer High Schools. With the help of the Palm Beach Gardens Police & Fire Foundation, the program added its first all-girls class in 2018. Suits for Seniors Girls are pictured here with guest speakers Caren Kittredge, Senior Director of Global Strategic Marketing at Carrier and PBG Mayor Maria Marino. OPPOSITE PAGE: K9 Fargo was purchased two years ago by PBG Police & Fire Foundation. Trained to detect explosives, this Belgian Malinois-German shepherd mix works with Gardens Officer Mike Valerio. belts. Community outreach programs funded by the Foundation include the “Suits for Seniors” program at both Palm Beach Gardens and Dwyer High Schools, the Ball Stars Basketball Camp and crime prevention and safety programs. The Foundation was the primary sponsor for the 2019 Public Safety Day attended by over 3,000 residents and we support the Joy Drive every year, helping Department volunteers provide toys to kids for the Holidays. These are all programs that allow the Departments to reach beyond its employees and have a real impact on our local community. These community outreach programs help convey important information, build relationships and raise awareness about the outstanding services provided to the more than 100,000 people who live, work and visit in Palm Beach Gardens every day. At the November 2018 Suits for Seniors Suiting Ceremony, the Palm Beach Gardens Police & Fire Foundation presented its sponsorship check of $15,000 to the program. was appointed as the president of the Palm Beach Gardens Police and Fire Foundation in January 2018. In this capacity, he works with a 9 member board made up of community leaders to create a safer Palm Beach Gardens through support of public safety programs. Irwin is a former president of Ingalls Shipbuilding and is a resident of BallenIsles. The next generation of police cruisers will soon hit the streets of Palm Beach Gardens. these vehicles are considerably safer than sedans and are less prone to rollovers. “The focus of these new vehicles is safety. Not only are they safer for the officer, they are more visible to the public,” says Rogers. “The transition to SUVs underscores the importance of safety for both officers and city residents, while also being adaptive to the demands of the profession. This results in a better delivery of service to the residents of Palm Beach Gardens.” Since the new SUVs are being leased, the city will be able to accelerate its vehicle replacement schedule, saving on long-term expenses associated with maintenance, and wear and tear. While new vehicles have already begun to rollout, the department expects the transition to be completed over the next two to three years. Cinco de Mayo at The Dancing Crane Food and drink specials all day long! Visit Facebook for details. Administrative Professionals Day at The Dancing Crane Bring your Administrative Professional to lunch - Each Admin lunch ½ price. Every Sunday at The Dancing Crane 10 a.m. – 3 p.m.
With the addition of five acres of multipurpose fields at Joseph Russo Athletic Complex in 2017, the City took a new approach to its turfgrass science. Turfgrass science is the study of grasses, soils, moisture content, pests and the overall maintenance of athletic fields. require sprigging Latitude 36 Bermuda Grass and takes 1200 bushels per acre. could not use multipurpose fields while the turf was given time to rest and recover. The Cityâ&#x20AC;&#x2122;s Parks and Grounds staff also utilizes these closure periods to perform its routine maintenance practices including, but not limited to aerA healthy root zone is 6-12 inches in depth. The photo on the left ation, verticutting, slicing, shows a shallow root system with compacted soils. The image on topdressing, turfgrass repairs, the right depicts a fibrous root system with porous soils. and scalping in a constant attempt to provide the best possible playing surface for our youth. period with the new fields at Russo Complex, no sod repairs were required. This The Cityâ&#x20AC;&#x2122;s previous closures consisted of resulted in improved accommodations for two 8-week periods and required two renthe Palm Beach Gardens Youth Athletic ovations. With the updated approach to Association to welcome more events and turf science, closures have been reduced tournaments. The same approach to Turfto total of 12 weeks. This is done five grass Science is currently underway with times a year for shorter periods (no more the construction of The Gardens North than 2-3 weeks). In our 18-month trial County District Park. This new park located adjacent to the Palm Beach Gardens Tennis Center & Joseph R. Russo Athletic Complex on 117 Court N. is expected to be completed by June of this year. As construction continues in full swing, patrons can now see structures taking form above ground. These include: Seven regulation size multipurpose fields, two concession stands with restrooms, a playground, splash pad, sidewalk system, nature trails and some turf installation. The total 68-acre park is projected to cost $13 million and is funded by the One-Cent Sales Tax. The City is currently negotiating a Public Private Partnership (P3) Agreement for the development of an indoor recreational facility on the remaining 14 acres. The expansion and renovation of City Hall kicked off in late February when much of the landscaping in front of the building was removed and repurposed elsewhere at City facilities. As the construction fencing went up, access to the Building Department was rerouted to the main entrance of City Hall. All customer service and building department functions will continue as normal. Completion of this $7.02 million project is expected by spring 2020 and will result in the renovation of an existing 9,000 sq. ft and the addition of 17,000 sq. ft. The widening of Johnson Dairy Road was completed in late 2018, paving the way for the upcoming completion of the Operations Center. You may also have noticed the new entrance sign for City Hall. At this time, passersby can see the red steel frame of the Operations Center, which is gradually being covered by stucco. This project will be completed by this summer when Public Services and Fleet Maintenance staff will move in to the $6.7 million facility. The porte-cochère at City Hall was demolished in midMarch, making way for expansion of the building. Once The Gardens North County District Park opens this summer, construction will begin on expansion of the Gardens Park Baseball program. This $2.5 million expansion project will include one new regulation size baseball field, covered batting cages and pitching areas, an artificial turf practice area for simulated infield play, shade structures, and approximately 190 additional parking spaces. Another aspect that will be incorporated into the new baseball field is a 10,000 square foot training facility. The proposed public-private partnership with Cressey Sports Performance Florida would bring world class quality training to Palm Beach Gardens. Construction and operation of the facility will be funded by the private entity at no cost to the City. We look forward the playing ball in the summer of 2020!